The StarTrac S-TBT Total Body Trainer is built with premier quality components that match or beat competitors in every category. If you’ve had a chance to workout on one of these machines at your health club, now you have the option to buy one for home use. The console on the StarTrac S-TBT Total Body Trainer features a large 4-character message window and a ¼-mile motivational track. The readout displays Profile Scrolling, Time, Heart Rate, Calories, Watts, Distance, Speed, and METs. The pre-set programs include Dynamic Heart Rate Control® workouts that adjust the intensity level based on the user’s heart rate during interval training. The Star Trac S-TBT Total Body Trainer is the least expensive of the Total Body Trainer line. 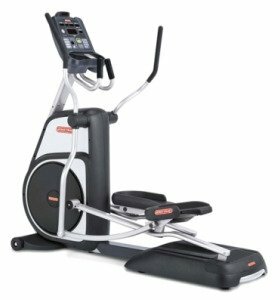 Like its more expensive siblings, these S-series ellipticals come with high quality electronics, a smooth elliptical motion, narrow pedal spacing, a personal fan, and the look and feel of a commercial machine. The high-end E-Series Total Body Trainers at $7,749 MSRP have 15" LCD HD touch screens, iPod ports, and most important – the SelectFit™ adjustable Upper Body technology. The StarTrac S-TBT does not and those missing goodies bring down the value of this model. StarTrac’s best-known health club product is the original Spinner® NXT, the ultimate in indoor cycling bikes, and their high-end treadmills that range from $6K to $10K. Star Trac’s ellipticals, which they prefer to call Total Body Trainers, are also stunning, especially the E-TBT and P-TBT models which are a better price/value than the stripped down S-TBT. There aren’t many elliptical reviews of the StarTrac home trainers since it hasn’t been offered to the consumer market until recently. Just keep in mind that StarTrac’s home TBTs are exactly the same units as the total body trainers sold to fitness clubs for strenuous commercial use (defined as more than 8 hours of operation per day). The StarTrac S-TBT Total Body Trainer is a solid, high quality, beautiful elliptical that lacks the value for home users if they have to pay the full MSRP of $4,595. Fortunately, that isn’t the case when shopping online. The good news is that you can find this elliptical trainer discounted at $3,500 at Amazon, and we’ve seen it as low as $3,100 at BigFitness. If you can get the Star Trac S-TBT Total Body Trainer for around that price, then it is a very good deal and an excellent choice for your home cardio gym.